HomeBfA: Do You Feel At Home? BfA: Do You Feel At Home? With all the aspects of the launch now live, I want to ask: how do you feel about the world we’re now living in? I’ve seen pretty much everything about the zones and the gameplay except for the first raid (LFR tonight! ), and I must say I’m not only settled, but extremely comfortable with the expansion. I’m enjoying leveling a lot. Replayability is great. There’s a lot of variety within the same zones. You can pick your questing hubs, and it’s never as straightforward as Stormheim or Highmountain. And certainly having different experience for Horde/Alliance helps. Leveling pace is insane, you hit 120 way before you finish the three zones. Zones are an eye candy and very pleasant to travel through… hell, just to be there. Exploration is bliss, I feel like there are many stones left unturned yet. World quests take you to the places you’ve never been to. There is always an option of a sudden discovery! I’m not a fan of these hydrocore-whatever mats I presumably need from mythics – and I will not craft this type of gear. But overall professions on leveling feel like they should. There is a nice progress feeling, little to no questing (although open world would be nice for crafting ones). I’ve hit 150 on skinning and 142 on tailoring. I’m enjoying leveling professions, and I’m already getting some benefit from them – for example, I’ve replaced all gear for a leather toon with 225s upon reaching 111 level. Scrapper is genius, as well as mats dumping options (warfront and emissary contributions). No, I think it’s not the time to wave the professions away – even if the crafted gear may be a purely cosmetic transmog option. They’re not bound to make an extreme difference and be your second job – they’re to add flavor. The initiate leveling -> dungeons -> heroic dungeons -> raids routine is ultimately broken, and this is so good. Basically we are not obliged to do any activity except we want to. You can suit up via dungeons, raids, world quests, warfronts, reputations – choose what you like. And easily so. It’s a playground for casuals like me, and for altoholics (also like me). You are now not requested to repeatedly run the one and only type of content to get this miserable 5-10 ilvl to access raids. If in a hurry, combine several options, and you will skyrocket a fresh toon in no time. I think for the first time I’m not anticipating my alt level caps with misery, with the looming perspective of re-running same dungeons to puke degree – and this is great. Let this sink in: upon 120 you gear up in a relaxed mode, and do things of your choice. All the gameplay so far is simply amazing (not you, island expeditions). A month into expansion I’m not sick of leveling content with alts, but I’m re-running it with pleasure. I have a whole world in front of me. I have my many carrots to run for, and I may do so in a very relaxed mode, in the greatest variety of ways WoW managed to offer so far. Doing so in the continents I simply don’t want to leave – so cozy they feel. 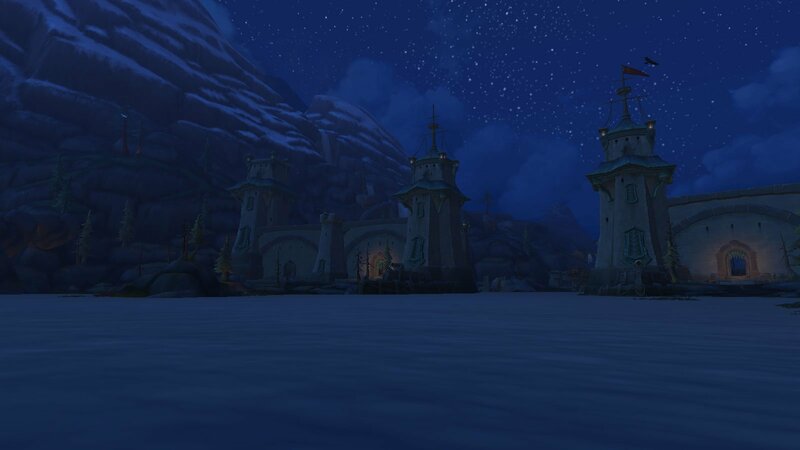 I actually know my way around Boralus! When I first went there with the wonky staircases and walkways to the wrong way, I was really worried about always being turned around, like I do in Stormwind when ground bound. I’m not! I’m actually thinking of Tiragarde as my best option :) And Horde’s Nazmir. It sounds strange, but these zones grow in slowly, and then suddenly you’re in love with them. On the Horde side, I left Nazmir for the end, my character is now at the very start of that zone (I figured from Blizzcon that I would love it, so left it for last). How about the soundtrack? I am amazed with it. I will say I am not super into the expansion but I am liking it enough. Lukewarm perhaps. I do not like island expeditions. They will need a heavy redesign for me to find them enjoyable. I think warfronts look cool, but I do not know because of the long time it takes to get to try it out, which I do not like and hope they rework for shorter cycle times. And allied races I think are a cool concept and look cool. I just do not like how they are implemented. I do not agree with needing a reputation level to play a race. I’ll eventually have a warfrint to try and eventually have the requirements for allied races done no doubt, just parts of their new systems I don’t like. I am however loving the new zones. They feel less cramped than legion. The new rep mounts don’t appear to be from paragon chests too, which is a plus! The new cities are so big and fantastic looking. Dazar’alor is a little bit hectic to navigate though. I like most of the world quests. There is some variety in them, but please no more collection style quests where drop rate isn’t 100%!! I am slowly going through the zones now on my story alts. Reading everything and immersing myself. I’ve only completed Tiragarde completely and I enjoy it. All in all, parts I enjoy, parts I don’t, and parts I think need improvement. I just saw Night Elves in Drustvar /Joy!